Daily Feeding Guidelines See pack for feeding guidelines. 363kcal / 100g This is a nutritionally complete food for puppies and young dogs. Requirements depend on the amount of exercise, age, breed, environmental factors, gender, neutered status and individual variation. The chart can be used as a general guide, together with good sense and experience. For overweight dogs, daily amounts should be based on target weight not actual weight. A bowl of fresh water should be nearby. 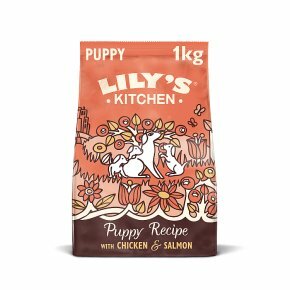 New to Lily's Kitchen? When serving your pet Lily's Kitchen for the first time transition over a period of a week, gradually increasing the ratio of Lily's Kitchen to your old food.